Eleena’s musical journey began at a very early age. She started to study piano at the age 5. She comes from a very musical family. Her grandfather was an opera conductor and grandmother – a renowned piano teacher. Both of her parents are musicians as well. Eleena has earned her Master Degree in Piano Performance and Pedagogy at the National Music Academy in Kiev, Ukraine. During her studies and after graduation she performed extensively throughout Europe as a pianist and a chamber music performer. Eleena is an award winning pianist. In 2002 she was honored to receive the National Stravinsky’s Award in piano performance in Ukraine. In 2013 she performed a solo recital in Jerusalem, Israel and was granted a National award. In the US Eleena continues to perform solo recitals and teaches a wide variety of pupils of all ages and levels. 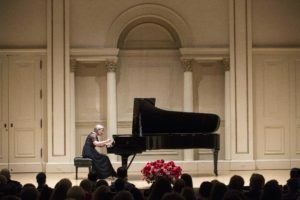 Eleena received Second Prize at the 2018 International Piano Competition in New York and was invited to perform at Carnegie Hall.